Welcome to Improving Teacher-Student Relationships. We are excited that over 800 of you have decided to join us for this course. We have spent the summer curating resources for this MOOC. It has been a wonderful intellectual journey for us. 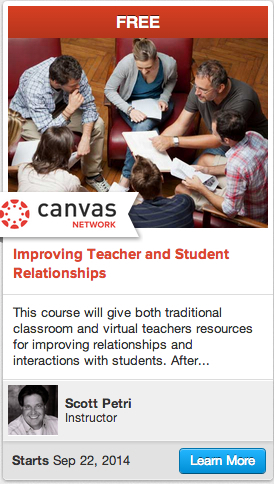 We hope it becomes a rewarding endeavor for you and helps you improve the relationships in your classroom. While Mr. Thomas is an experienced online educator, I have been more of a traditional classroom teacher throughout my career. Last year, I became a 1:1 iPad educator, which not only helped me lower my class fail rate by 50%, but also helped me forge deeper relationships with my students. I have used student surveys for years. We will talk more about them in Week Three. Classroom surveys have definitely helped me learn what is important to my students. Last year, working in a 1:1 environment also helped me personalize education and connect with more students. For the first five weeks of the semester, I had a student who I will call Valerie (not her real name). I knew she was very smart, but she wasn’t engaged in class, wasn’t completing her classwork, and wasn’t doing any of my homework. She was painfully shy and would not interact with me or the other students. After a survey revealed that approximately 90 percent of my students had internet access at home, I started offering extra-credit assignments online. To my surprise, Valerie became my early adopter. She started posting to the class discussion boards even though she would never contribute to discussions in class. She began participating in virtual field trips and engaged in every online assignment that I offered. Within five weeks, her grade had gone from an F to a C and it was rising each week. I began talking to her about comments she had made online. It was evident that she understood the World History readings and could connect the materials to modern day problems. One day, I lobbed a softball her way by asking her a question she had answered on the discussion board. One of my particularly domineering student’s head swiveled in astonishment as Valerie completed her answer. “You know how to talk and you know what you are talking about,” he gasped. I saw a little flash of a smile slide across her face and she never looked back. Although, Valerie never blossomed into what I would call an extrovert, she began actively participating in most class activities and finished the year with the highest grade in the class. As I reflected on the year, I realized that if it weren’t for the 1:1 environment, I probably would have written Valerie off and she most likely would have failed my course. I was only able to reach her via online methods. After we built a virtual relationship, she felt comfortable enough to establish a real relationship. This school year, I was pleased to see Valerie hanging out on the quad with another student from our class. She has turned her high school life around. Teaching can be such a rewarding profession, but it is not easy. Sometimes students make it near impossible to build positive relationships with them. I know I am frequently haunted by thoughts of the students that I have been unable to reach. We all know what life is like for high school dropouts. Educators save lives one at a time. I hope this course helps you find and connect with the Valeries in your classes. I look forward to spending the next six weeks with you. 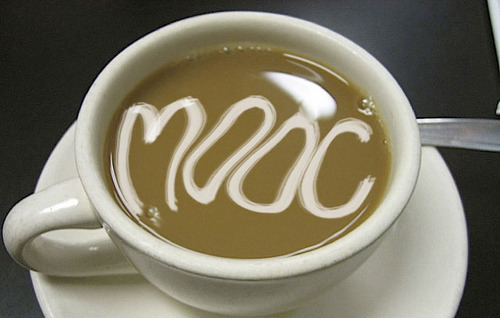 Can MOOCs Improve Teacher PD? School districts spend the equivalent of $200/pupil on professional development (Killeen, Monk, & Plecki, 2002). Unfortunately, teachers often view professional development as ineffectual or a waste of their time. Many programs offer “fragmented, intellectually superficial” seminars (Borko, 2004, p 3). Worse, these PDs do not provide ongoing support for implementing new strategies or tools (Barnett, 2002). This makes it difficult for teachers to implement new practices in environments resistant to change. Anant Agarwal argues that massively open online courses matter and they should be viewed as next-generation textbooks. Educational leaders should take what we already know about MOOCs and use that information to drive change. For instance, research shows the people who benefit most from MOOCs are people who are already employed and who have multiple degrees. In my industry, we call these folks unionized teachers. There are approximately three million of them in the United States. Educational leaders should pilot test using MOOCs as PD modules and pair them with screening tools that identify teachers who are innovative, and proactive risk takers. 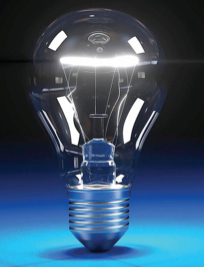 Then, when districts want to implement new technology or pedagogical initiatives, they have a ready pool of talent are willing to try new things. 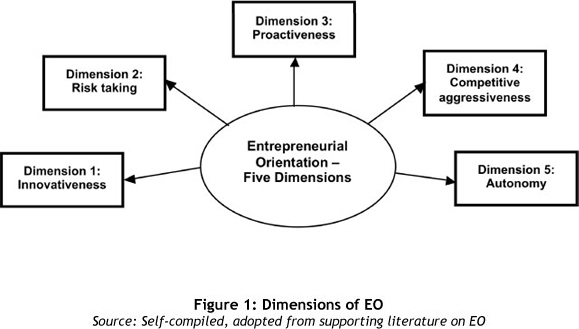 Dede et al (2005) reviewed nearly four hundred articles about online, face-to-face, and hybrid teacher professional development programs (the full list is available at http://www.gse.harvard.edu/~dedech/oTPD_list.pdf). 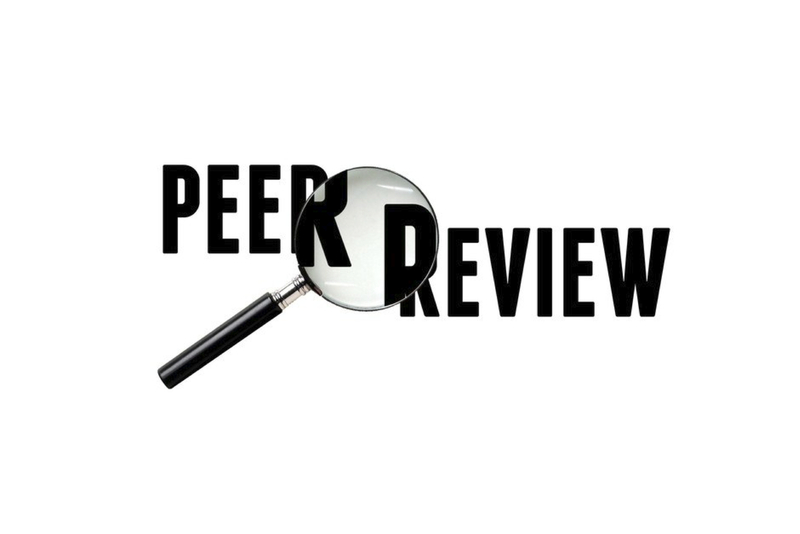 The researchers examined forty research studies that represented high quality empirical research. The focus and purpose of these studies addressed five areas of concern: (a) Design of professional development; (b) Effectiveness of professional development; (c) Technology to support professional development; (d) Online communication and professional development; and (e) Research methods. These best practices deserve greater examination and experimentation. MOOCs offer educational leaders an opportunity to cost-effectively pilot test staff training programs. Further, they produce robust data sets that illustrate which learning activities are effective. This information can be analyzed to fine-tune the rollout of costly programs like 1:1 implementations. While for-profit entities shop their online education wares to low-income students in need of credit recovery, perhaps the smart play is to market MOOCs to people who want to be life-long learners, improve their technical skills, and increase their pedagogical moves. These people are already in your buildings. They are your teachers. 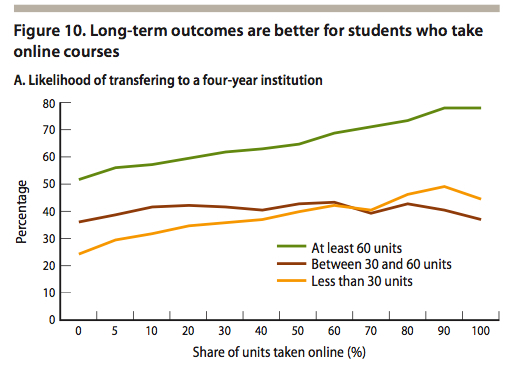 Credit recovery is the fastest growing area of online learning (McCabe & St. Andrie, 2012). These programs are highly unregulated and there is minimal information on their enrollments or effectiveness. It would be fair to say that most credit recovery programs have not been examined empirically. For virtual learning providers, this segment has proven to be a gold mine. Apex Learning, estimates that 50% of its enrollments are for credit recovery. 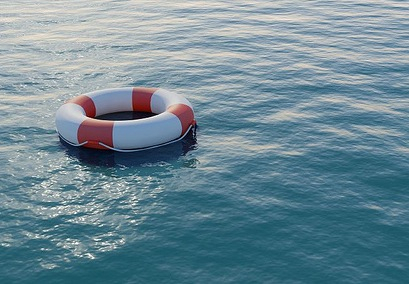 Aventa Learning reported a 500% increase in its credit recovery business. The Sloan Consortium stated that credit recovery is the most popular type of its fully online courses. Molnar (2013) predicted that revenues from the K-12 online learning industry would grow by 43% between 2010 and 2015, with revenues reaching $24.4 billion. As an educational researcher, this begs a question: Are virtual school/credit recovery operators preying on low-income students? I assume that a disproportionate number of credit recovery students may be low-income. This may be due to my personal experience of working in a district where 80% of students are eligible for free and reduced priced lunch. Miron & Urschel (2012) found 39.9% of K12, Inc’s online students qualified for free or reduced-price lunch, compared with 47.2% for the same-state comparison group. In my district’s virtual academy, only 61% of students are classified as low-income, which is 19% lower than the district as a whole. Therefore, you might expect stronger academic performance from the virtual program, however, with a 630 API, the virtual program ranks 116 points below the District’s API of 746. Decades of educational research have made it clear that low-income students are at the greatest risk for school failure. 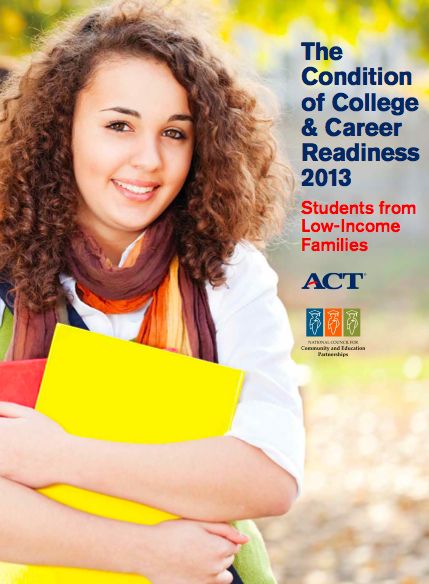 The ACT corroborates this in a recently released report: The Condition of College & Career Readiness 2013: Students From Low-Income Families. The authors used data from 1.8 million ACT-tested high school graduates from the US class of 2013. Of those, 428,549 (24%) were identified as being from low-income families. Nearly all (95%) of low-income students indicated they want to go to college, but only 69% took the recommended college prep curriculum in high school. 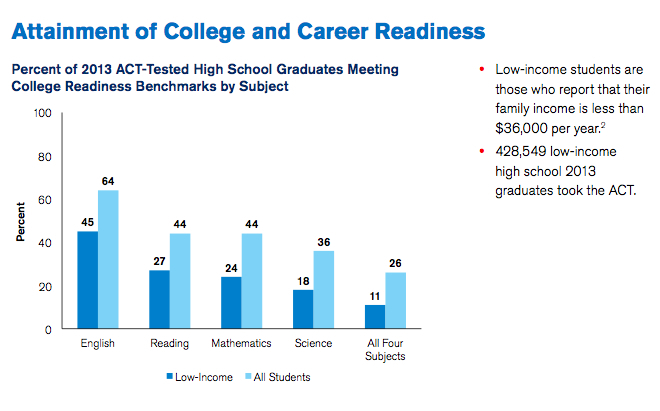 Worse, only 20% of students met at least three of the four ACT College Readiness Benchmarks. 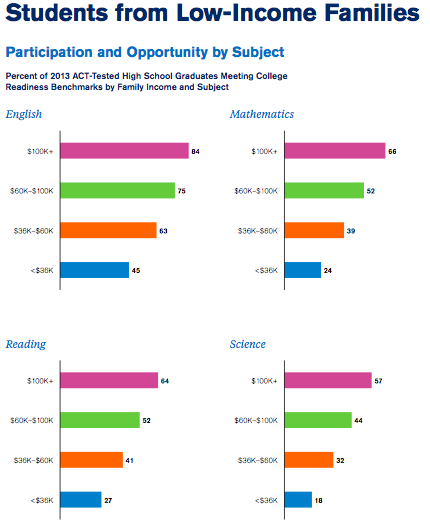 Nearly half (49%) of students from low-income families did not meet any benchmarks. 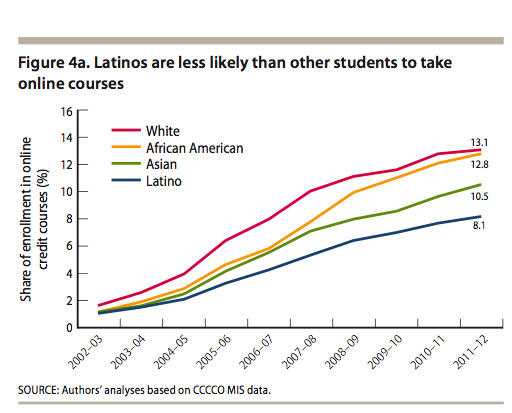 It is difficult to understand why educational leaders keep pushing low-income students who are the least likely to be successful into virtual/online programs where ten years of data from California Community Colleges (the very places where most of the low-income students wind up) has demonstrated that 4 out of every 10 of them will fail. Perhaps it is time to end the credit recovery experiment in low-income schools. Reichert & Hawley (2014) argued that the teacher-student connection does not merely contribute to or enhance teaching and learning; this relationship is the very medium through which successful teaching and learning is carried out. If policymakers were data-driven like teachers, they would understand that it is time to intervene and push virtual/online programs into affluent schools and ration our high-cost, high-touch, empathetic teaching talent for the struggle in low-income public schools. Instead, I suspect we will allow the free market to propagate the current policies that result in half of low-income students going 0 for 4 on ACT college benchmarks. City of Angels Virtual School & Independent Study Program. (2014).